but as his care partner. and the principles that guide our lives. of who she is in her role. on the other end of all that giving. I believe it is difficult to do so. So I like this idea of care partnering. Indeed, that is our clear reality. and we are equally moving to our deaths. Any feelings we have are equal. So are any yearnings, any dreams, any hopes. equally qualified to be forgiven. Our pasts are equally a part of us. Our futures on earth are equally unknowable. We are absolutely equally human. We are made up of equal sparks of the divine. 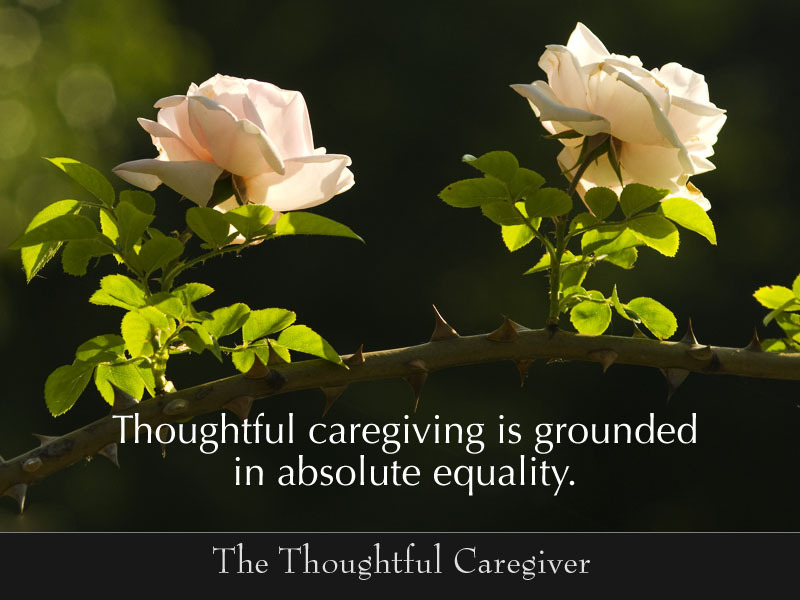 This entry was posted on November 14, 2007 at 1:07 pm and is filed under Caregiver Truths, Caregiving, Caregiving & Spirituality, Validation. You can follow any responses to this entry through the RSS 2.0 feed. You can leave a response, or trackback from your own site.